>The Amsterdam School (Dutch: Amsterdamse School) is a style of architecture that arose in the early part of the 20th Century in The Netherlands. Imbued with socialist ideals, it was applied to all manner of buildings, including homes and apartment blocks, and was partly a reaction to what was considered “bourgeois” neo-gothic and other revival styles, as well as to the work of Hendrik Petrus Berlage. The style, highly influenced by Expressionism, was characterized by the use of rounded, organic facades with many purely decorative, non-functional elements such as spires, sculptures and “ladder” windows (with horizontal bars reminiscent of ladder steps). The movement had its origins in the office of architect Eduard Cuypers in Amsterdam. Although Cuypers wasn’t a progressive architect himself, he did give his employees plenty of opportunity to develop. The three leaders of the Amsterdam School Michel de Klerk, Johan van der Mey and Piet Kramer all worked for Cuypers until about 1910. Impetus for the movement also came from the city. In 1905 Amsterdam was the first city to establish a building code, and the city hired Johan van der Mey afterwards, in the special position as “Aesthetic Advisor”, to bring artistic unity and vision to its built environment. Van der Mey’s major commission, the 1912 cooperative-commercial Scheepvaarthuis (Shipping House), is considered the starting point of the movement, and the three of them collaborated on that building. The Scheepvaarthuis is the prototype for Amsterdam School work: brick construction with complicated masonry, traditional massing, and the integration of an elaborate scheme of building elements (decorative masonry, art glass, wrought ironwork, spatial grammar, and especially integrated figurative sculpture) that embodies and expresses the identity of the building. The aim was to create a total architectural experience, interior and exterior, that carried social meaning. The most important and productive member of the Amsterdam school was Michel de Klerk. Other members of the Amsterdam School included Jan Gratama (who gave it its name), P. H. Endt, H. Th. Wijdeveld, J. F. Staal, C. J. Blaauw, and P. L. Marnette. The journal Wendingen (“Windings” or “Changes”), published between 1918 and 1931, was considered the magazine of the Amsterdam School. 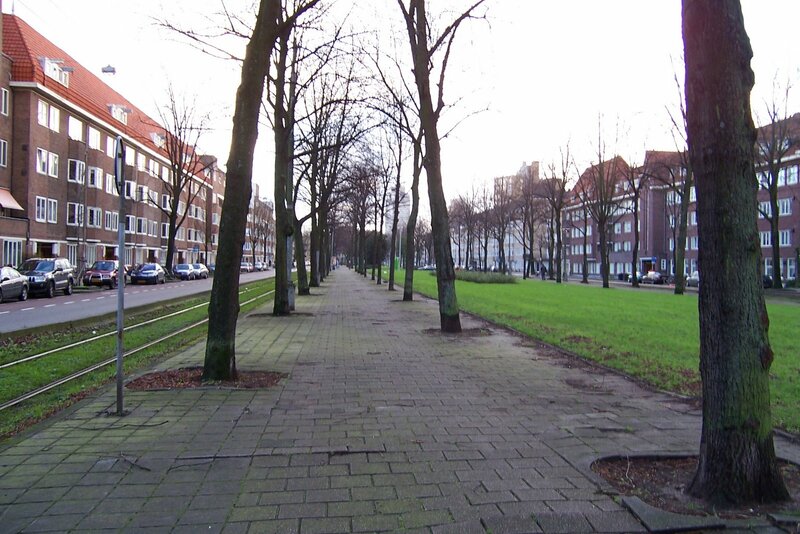 The most important examples of the style are obviously found in Amsterdam, the single most important of which probably is Het Schip, designed by de Klerk. The movement and its followers played an important role in Berlage’s plans for the expansion of Amsterdam. After De Klerk died in 1923 the style lost most of its importance. The De Bijenkorf department-store in the Hague of 1924 is considered to be the last example of “classic” Amsterdam School expressionism. Moderate variants of the style survived until the Second World War, for example in Protestant church architecture.